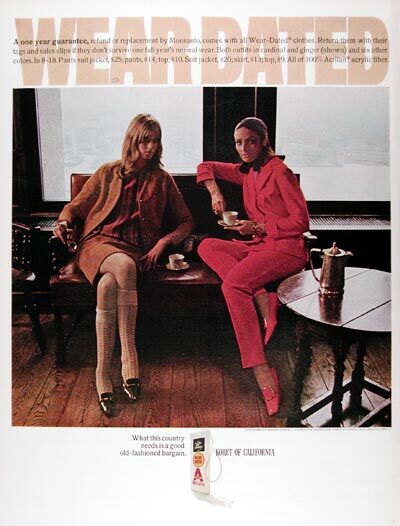 1967 Monsanto Wear-Dated Fashions original vintage advertisement. A one year guarantee, refund or replacement by Monsanto comes with all Wear Dated clothes. Return them with their tags and sales slips if they don't survive one full year's normal wear. Pants suit with jacket $25; suit jacket $20, skirt $13, top $9. All 100% Acrilan acrylic fiber.